Bring a large pot of salted water to a boil for the gnocchi. Peel and roughly chop the onion and garlic. Trim and halve the zucchini lengthwise, then cut into ½ inch half moons. Pick the basil leaves. Place a large nonstick skillet over medium-high heat with 2 tsp olive oil. Once hot, add the chopped onion, chopped garlic, just 1¼ cups corn kernels, and a pinch of salt and pepper. Cook, tossing occasionally, until the onions soften and the corn begins to brown, about 5 to 8 minutes. Add the gnocchi to the large pot of boiling water and cook until they float to the surface, about 3 to 5 minutes. Once cooked, reserve 3/4 cup pasta water then drain the cooked gnocchi. Add the corn and onion mixture, scallion cashew cheese, and the reserved pasta water to a blender. Blend on high until smooth. Wipe skillet clean and return to medium heat with 1 tbsp olive oil. 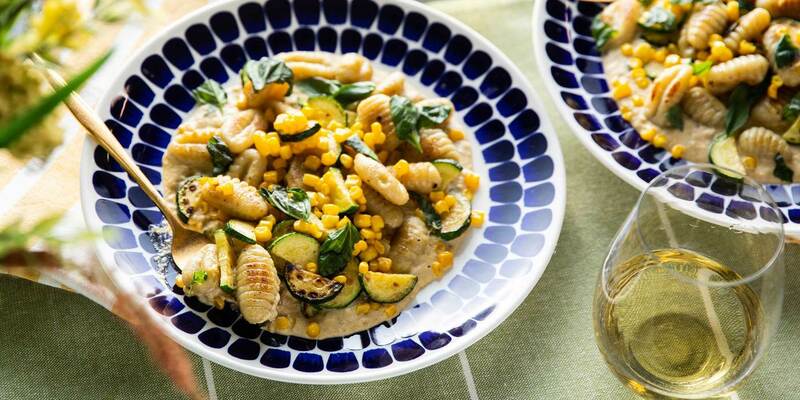 Once hot, add the zucchini, cooked gnocchi, remaining corn kernels, and a pinch of salt and pepper. Cook, tossing occasionally, until the zucchini and gnocchi are browned in places, about 5 to 8 minutes. Spread the corn crema in shallow bowls. Top with the gnocchi and hand tear the basil leaves over the dish. Enjoy!